It’s Sunday! Time to kick back, relax, and start the holiday season. Christmas songs on the radio, stores are stocked with gift items, movies and specials are on tv, and peppermint mochas are available at your favorite coffee shop. The holiday season has officially begun. Are you ready for it? I don’t get into the Christmas spirit until after Thanksgiving. One holiday at a time please. But after Thanksgiving then I am in it 100%! It really is my favorite time of the year! The day after Thanksgiving is Black Friday…ugh. I want nothing to do with it. I would much rather stay home and put up my tree and stay out of the chaos. Cino loves when the tree goes up so she can play and sleep under the tree skirt. The seasonal drinks…they are heavenly! 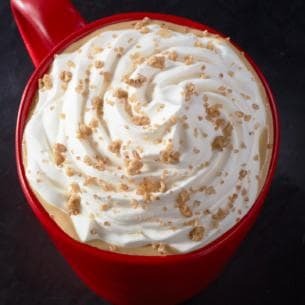 I’ll probably get a Peppermint Mocha sometime this season but right now I am pretty hooked on the Starbucks Chestnut Praline Lattes with coconut milk. Mmmm, mmmm good! Do you have a favorite seasonal beverage? There is baking cookies too. Next weekend I will be getting together with some friends so we can get our Christmas baking underway. Yes, the season is definitely on its way! Unfortunately sometimes this time of year can also bring stress, depression, and chaos. So let’s not forget to slow down and enjoy. Happy Sunday (and Happy Beginning of the Season)! This entry was posted in Animals, pets, Sunday Pause (Paws) and tagged animals, Christmas, holidays, pets, seasons on December 2, 2018 by Animals Are Feeling Beings Too. So so sorry for the loss of Max. Prayers! You are such a great person to have cared for him and all the cats/animals you care for. Let that give you some comfort. Sorry but I got you mixed up with someone else who asked me to do posts about my cats which I in turn said I was way to busy to do. Apologies for the mixup. Chanukah actually starts tonight at sunset, extremely early this year. Like you, I don’t focus on any of the holidays until after Thanksgiving.